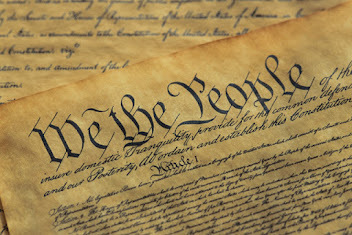 Virginia’s first constitution, adopted in June 1776, served as a model for the founding documents of other states, as well as for the Constitution of the United States. Scholars attribute the constitution’s preamble to statesman Thomas Jefferson, who was a delegate to the Continental Congress at the time. Virginia statesman George Mason drafted a significant portion of the constitution itself. The content and spelling of this document reflect the conventions and biases of the era in which it was written. 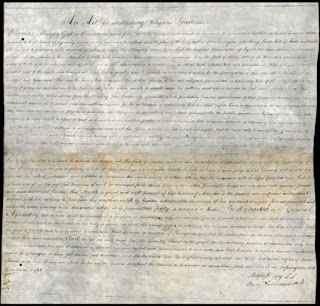 A constitution, or form of government, agreed to and resolved upon by the Delegates and Representatives of the several Counties and Corporations of Virginia. The sd house of Representatives shall be composed of persons chosen by the people annually on the [1st day of October] and shall meet in General assembly on the [1st day of November] following and so from time to time on their own adjournments, or at any time when summoned by the Administrator and shall continue sitting so long as they shall think the publick service requires. The number of Representatives for each county or borough shall be so proportioned to the numbers of it's qualified electors that the whole number of representatives shall not exceed  nor be less than [125.] for the present there shall be one representative for every [ ] qualified electors in each county or borough: but whenever this or any future proportion shall be likely to exceed or fall short of the limits beforementioned, it shall be again adjusted by the house of representatives. None of these fundamental laws and principles of government shall be repealed or altered, but by the personal consent of the people on summons to meet in their respective counties on one and the same day by an act of Legislature to be passed for every special occasion: and if in such county meetings the people of two thirds of the counties shall give their suffrage for any particular alteration or repeal referred to them by the said act, the same shall be accordingly repealed or altered, and such repeal or alteration shall take it's place among these fundamentals and stand on the same footing with them, in lieu of the article repealed or altered. View original document, Library of Congress.